Nation's first four-year medical school. Trained 400 African American physicians. Operated here from 1882 to 1918. 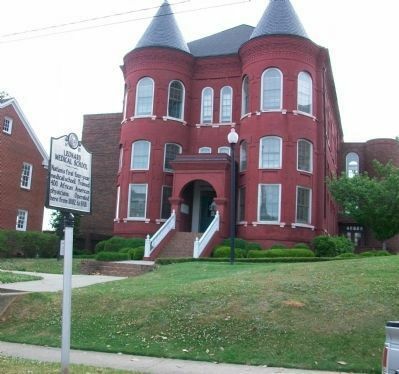 Shaw University was founded in 1865 by Henry M. Tupper, a white minister from Massachusetts. Tupper, the school’s first president, decided to try to establish a medical school. He secured a pledge for $5,000 from his brother-in-law Judson Wade Leonard and raised another $3,900. With the funds, a thirty-four-room dormitory for medical students was built on campus. In 1881 the legislature donated an acre adjacent to Shaw that had been part of the old Governor’s Palace property. There a classroom building was constructed and Leonard Medical School opened in 1882. Four medical schools for African-Americans predated it. Leonard was the first such school in the United States to offer a four-year graded curriculum of the sort used today. The four-year course of study was made the standard in 1893, eleven years after Leonard had instituted it. 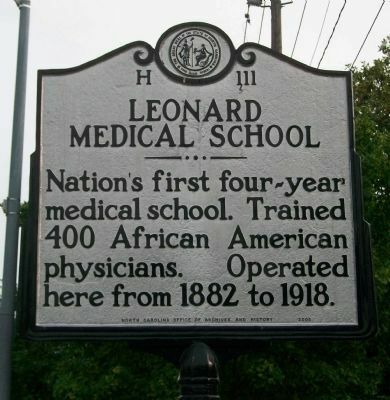 In North Carolina medical schools for whites contemporary to Leonard were the University of North Carolina School of Medicine (1879), the Davidson College School of Medicine (1887, later called the North Carolina Medical College until it closed in 1918), and the University Medical Department at Raleigh, a branch of UNC offering clinical instruction at Raleigh hospitals (1902 to 1910). In January 1885 Leonard Hospital opened, providing twenty-five beds for the local black community and valuable experience for the students. In 1886, the first six students completed their studies and exam. Cost of attending Leonard Medical School was never more than $100 per year, including living and tuition expenses, a sum that was one-half the cost of comparable programs for whites. Scholarships were awarded yet the cost still was often prohibitive. Historian Todd L. Savitt discovered letters begging for further financial aid and letters of withdrawal from students who could no longer afford the payments. Most of the approximately 400 physicians who graduated from Leonard practiced in the rural South and therefore were unable to support their alma mater. Due to financial difficulties and inability to keep up with modern medical standards, Leonard closed its hospital in 1914 and the medical school followed in 1918. All but two of the nation’s black medical schools were closed by 1924.